A/D and D/A conversion, HEXA Core UAD plug-in processing, 18×24 Thunderbolt 3 audio recording interface with 4 Unison mic preamps, Realtime Analog Classics Plus UAD plug-in bundle. 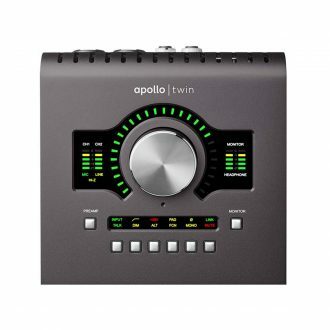 The Universal Audio Apollo X8 allows music producers and post-production studios to track, overdub, and mix with new world-beating A/D and D/A conversion, HEXA Core UAD plug-in processing, and 7.1 surround sound monitoring* — all in a sleek rackmount Thunderbolt 3 audio interface for Mac** or PC. 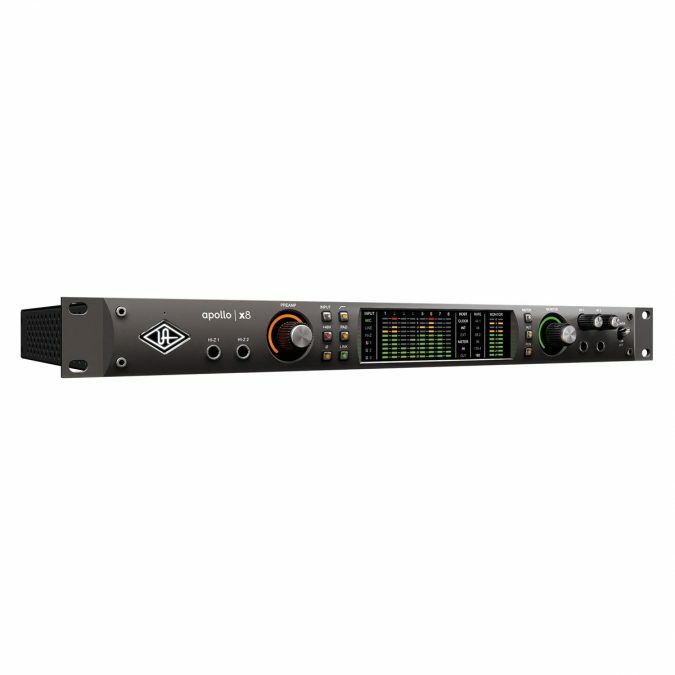 Built upon UA’s 60-year heritage of audio craftsmanship, this 18 x 24 interface easily outperforms everything in its class with two Unison -enabled mic preamps, providing authentic emulations of preamps from Neve, API, Manley, SSL, and more, plus all-new HEXA Core processing — yielding 50% more DSP for running UAD Powered Plug-Ins in real time. Record with elite-class A/D and D/A conversion — nearing the widest dynamic range and lowest noise available, at any price. 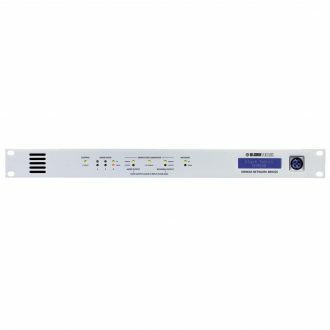 Track with near-zero latency through Unison preamp emulations from Neve, API, Manley, Helios, Fender, and more. Mix with powerful HEXA Core processing, featuring 6 UAD DSP chips for running more UAD Powered Plug-Ins in real time. 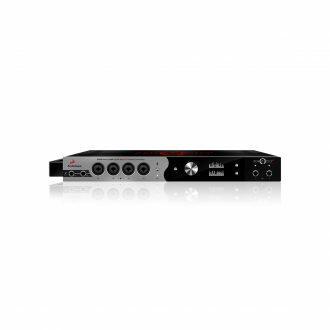 Integrate with high-end commercial systems, via 5.1 surround sound monitoring and selectable +24 dBu headroom. 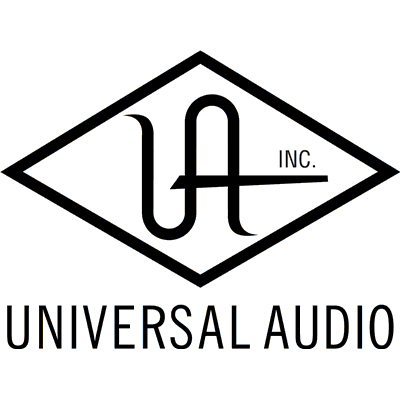 With 129 dB dynamic range and -119 dB THD+N, Universal Audio Apollo X8’s open, natural sound rivals any dedicated high-end converter on the market — regardless of price — and is the perfect starting point for applying UAD processing. The Universal Audio Apollo X8 features HEXA Core processing, with six DSP chips and 50% more UAD plug-in processing power than previous Apollos. This lets you run more UAD plug-ins, whether you’re tracking in real time with channel strips from Neve, Manley, or API, or running high UAD plug-in counts when mixing in your DAW. Perfect for electronic musicians and post production professionals who don’t require tons of mic inputs, Universal Audio Apollo X8 features two Unison-enabled mic preamps, letting you track through exacting mic preamp emulations from Neve, API, Manley, Helios, SSL, and Universal Audio. A Universal Audio exclusive, Unison technology nails the tone of these sought-after tube and solid state mic pres — including their input impedance, gain stage “sweet spots,” and the component-level circuit behaviors of the original hardware. The secret to Unison is its hardware-software integration between Apollo’s mic preamps and its onboard HEXA Core DSP Acceleration. Simply place a Unison preamp plug-in on your mic input in Apollo Console software, and it physically reconfigures the Apollo interface’s impedance — so you can tap into the classic sounds of the world’s most recorded mic preamps. A hallmark feature of Apollo is its Realtime UAD Processing, letting you run the full library of UAD plug-ins with near-zero latency. The Universal Audio Apollo X8 includes the Realtime Analog Classics Plus plug-in bundle, so you can record and mix with the world’s only authentic Teletronix LA-2A, 1176LN, and Fairchild compressors, the Unison-enabled UA 610-B Tube Preamp & EQ, and iconic guitar and bass amps from Marshall and Ampeg. Going beyond the included Realtime Analog Classics Plus plug-ins, Universal Audio Apollo X8 lets you tap into the full UAD Powered Plug-In library of legendary vintage EQs, compressors, reverbs, tape machines, channel strips, and more — at near-zero latency, regardless of your audio software’s buffer size and without taxing your computer’s CPU. With exclusive emulations from Neve, Studer, Manley, Helios, API, Ampex, SSL, Lexicon, Fender, and more,† it’s like having a studio full of iconic analog gear, in a single rack space. And unlike competing interfaces, these award-winning DSP-powered plug-ins are also available in your DAW for mixing. 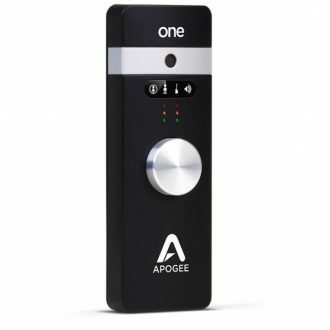 With comprehensive 5.1 surround monitoring support, Universal Audio Apollo X8 is a boon for engineers and producers working on audio and music for video games, television, and the web. 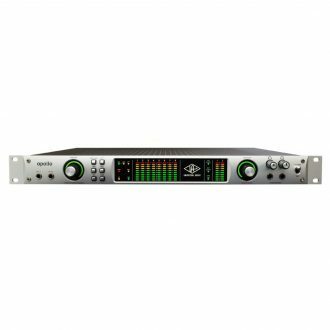 In addition, Universal Audio Apollo X8 offers selectable +24 dBu operation for out-of-the-box compatibility with professional mixing consoles and other high-end pro audio equipment. The Universal Audio Apollo X8 offers 18 x 24 simultaneous inputs/outputs (6 x 6 analog I/O) and two built-in Thunderbolt 3 ports. 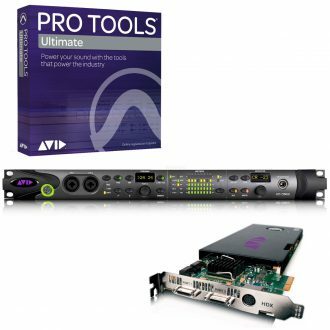 This allows users of any Thunderbolt-equipped Apollo Twin or Apollo rackmount audio interfaces to easily combine up to four Apollos and six total UAD-2 devices — adding fast, high-bandwidth I/O and DSP as your studio grows. Impart your tracks with the iconic warmth and character of the classic hardware used to track everyone from Duke Ellington to Coldplay. By emulating the entire signal path, including tube amplifiers, transformers, and circuit nonlinearities, the 610-B Tube Preamp and EQ plug-in injects organic detail and saturation to any signal — whether you’re re-amping or tracking through the 610-B via Universal Audio’s Unison technology. Introduced in 1969, the Ampeg SVT bass amp is still the reigning king of high-powered tube bass tone. Developed by Brainworx, the Ampeg SVT-VR Classic Bass Amp plug-in perfectly captures the raw power and punch that has made this the go-to amp for rock, funk, and soul players. Track in real time using Unison preamp technology for the tone, touch, and feel of a real SVT bass amp, or transform bland DI tracks with the thunderous roar of a stone cold classic. Modeled from a vintage early-’80s Pro Co Rat, Raw Distortion delivers all the gritty dynamic raunch of the legendary stompbox. And with Unison technology, you can plug in to Apollo Twin, 8, or 8p’s front-panel Hi-Z instrument jack and experience the same circuit interaction, gain range, and clip points for the true tone, feel, and response of the original hardware. 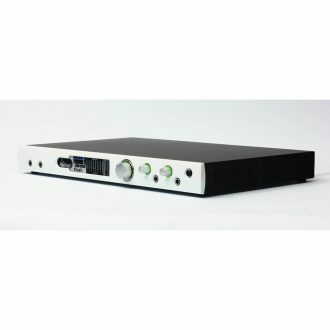 USB audio interface with 8 AD and 8 DA, four mic preamps, two front panel instrument inputs and 2 independent stereo headphone DA. Optional MDIO-PTHDX expansion card is available.